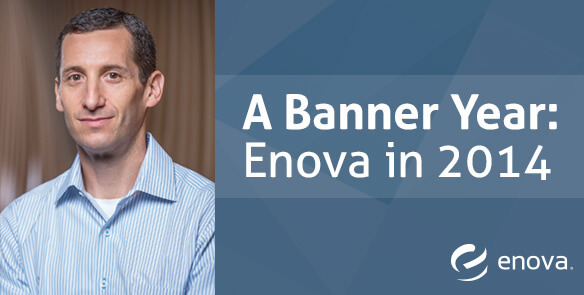 A Banner Year: Enova in 2014 - Enova International, Inc.
As December quickly ends, we can all look back on a year of exciting milestones for Enova. We celebrated our 10-year anniversary, launched several new product pilots, gave back to our communities in new ways through Enova Gives, and listed on the NYSE as an independent public company. We’ve come far as a company and positioned ourselves for continued success. Thank you to everyone for your hard work and dedication. 2014 marked the 10th anniversary of Enova’s first online loan. We’ve come a long way since our early days as a startup with a handful of employees and one product in one country. Today, Enova’s more than 1,000 associates serve customers in six countries around the world with many different products designed to help people and businesses get the credit that fits their needs. One thing that hasn’t changed is that Enova is still a tight group of smart, hard-working people all striving to add value and generate growth. Headway Capital – our first small business product, a line of credit for businesses in the U.S.
All of these pilots demonstrate the team at Enova’s ability to develop innovative new products and the flexibility of our online lending platform and business model, qualities that put us one step ahead of our competitors. On November 13, Enova spun-off from Cash America (thank you to Cash America associates for eight great years together) and listed on the NYSE as an independent public company trading under the ticker symbol “ENVA.” This symbol represents years of hard work by our talented team members, as well as the confidence shareholders have in our continued growth and success. Enova forged new partnerships with charitable organizations that focus on helping people improve their lives. In April, Enova began a partnership with Chicago Cares and Enova associates were able to plant community gardens, paint schools, and run a science fair for elementary school students. In total, volunteers donated 540 hours to worthy causes through our Chicago Cares partnership in 2014. Enova also launched the Enova Gives Associate Volunteer Day, which provides full-time corporate associates with one paid day per calendar year to volunteer for a nonprofit organization of their choice. I wish all Enova customers, associates, business partners, and shareholders a healthy and happy holiday season with friends and families and a prosperous 2015.